Rémy Di Gregorio will be rejoining the French peloton next season, having been cleared of possession of doping products in April of this year, French regional newspaper La Provence reports. The 28-year-old, who spent six seasons at la Française des Jeux [now FDJ.fr - ed] before riding for Astana and Cofidis, will take a step down from his previous level, however, as he signs a contract with his former amateur team La Pomme Marseille. On turning professional in 2005 Di Gregorio was hailed as one of the most exciting climbing talents of his generation, winning the mountains classification of the Critérium du Dauphiné. He was unable to live up to expectation, however, and didn’t take his biggest result - a stage of Paris-Nice - until he signed for Astana in 2011. 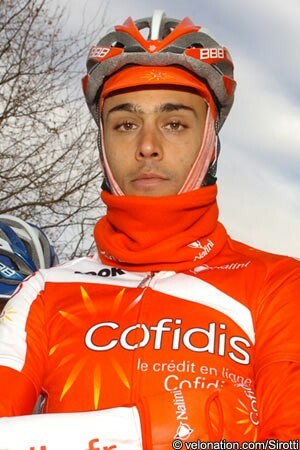 While riding the 2012 Tour in the colours of Cofidis, the rider from Marseille was arrested after the police raided the team’s hotel on the first rest day. He was fired by Cofidis, but cleared in April this year after it was adjudged that the products he had in possession of where legal vitamins, and he successfully sued the team for wrongful dismissal. Although he was cleared to race, Di Gregorio was unable to find a professional team this season, and competed for amateur French outfit Team Martigues SC-Vivelo. He won the 2.2-ranked Tour of Bulgaria in September, after winning the opening stage and holding the leader’s jersey all the way through. The rash of teams folding at the end of the 2013 season, and the flood of riders in transfer market, has meant that the 28-year-old has still been unable to secure a professional team, but will hope to be able to prove himself in what is one of the biggest Continental teams in France. Di Gregorio rode for what is his hometown team from 1999 - at the age of 14 - until he signed his first contract with La Française des Jeux. La Provence also announced a number of other La Pomme Marseille signings, including Lithuanian Evaldas Siskevicius, who returns to the team after a year with Sojasun, as he too takes a step back down to Continental level as the ProConti team folds. Both riders will hope to be able to use the shop window of the major races that La Pomme Marseille will likely be invited to. 2013 saw the Continental team invited to to most of the major French races outside the WorldTour, including the Critérium International, the Quatre Jours de Dunkerque and Paris-Tours. The team will also doubtless be looking to its new signings to perform, with biggest rider of 2013 Yannick Martinez - the son of 1978 Tour de France mountains jersey winner Mariano, and brother of former World and Olympic MTB champion Miguel - departing for Team Europcar.